Shade garden soil improvement is one of those tasks you should tackle before planting. One reason that the soil under backyard trees is generally poor is our neatnik habit of carting away fall leaves and plant debris. In the woods, where nobody rakes up, nutrients are recycled into rich layers of humus. This creates crumbly woodsy-smelling soil that shade plants love. The key to a successful shade garden is recreating woodland soil conditions by adding organic matter. To improve shade garden soil, you can dig the organic matter in, but this can be difficult if you have networks of dense tree roots. In this case, you may find it hard to dig anything in without killing yourself and doing major damage to the roots. If that’s your situation, just layer the organic material over the soil and then plant. But first, as for any planting, you need to clear the ground of weeds and unwanted plants. Herbicides such as Round-Up® work if you are careful to follow directions and keep the spray away from trees and the leaves of any plants you want to keep. However, many gardeners prefer not to use herbicides and instead dig out unwanted vegetation. To make this easier, water the area thoroughly before you start clearing if it’s been dry. 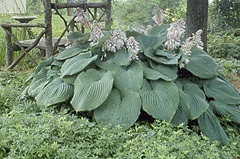 If your shade garden bed is too big or going at weed clearing by hand seems too daunting, try smothering the vegetation. Begin by mowing with your mower set low to the ground. Cover the paper layer with about 4 or 5 inches of organic material topped with an inch or two of fine wood chip mulch. The ideal organic material for shade gardening is a mixture of composted bark and leaf mold (composted leaves). If you don’t have leaf mold or compost, you can use well-rotted manure mixed with top soil and peat moss or a peat substitute. However, peat is quite dry, so be sure to dampen and mix it with one of the other forms of humus before putting it down. Wait several months to allow annual and perennial weeds to die off. If you do this in the fall, your bed will be ready to plant the following spring. The material you added will have settled quite a bit by spring. Too much soil or mulch and can damage trees by smothering their roots. Native oaks are particularly sensitive to extra soil over their root zones. Don’t lay newspapers, soil or mulch where they can touch the base of tree trunks as this could promote rot in the bark.